FULTON, NY – We are all aware of the benefits youth receive from increased physical activity. However finding the resources to offer them the opportunity to do so can be challenging. Thanks to the efforts of the Rural Health Network of Oswego County that challenge has gotten a little easier. 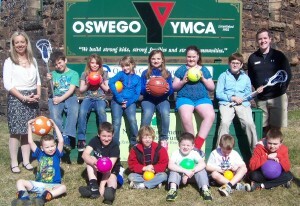 Danielle Wert (standing left), program coordinator for the Rural Health Network of Oswego County presented Oswego YMCA Adult and Youth Sports Director, Kyle Walton (standing right), with a variety of sports equipment for the Oswego YMCA’s youth recreation program. The donation is from the Rural Health Network’s County Health Issues sub-committee as part of its mission to increase physical activity for area youth. Seated in front from left are youth program participants; Jacob Burrow, Ethan Hart, August McDonald, Kai Clary, Caleb Hart, and Quentin Denkenberger. In the back row from left are; Brandon Sobrino, Cassie Timson, Lauren Goodberry, Taylor Meaker, Jasmine McCracken and Emrick Bendicto. The Rural Health Network’s County Health Issues sub-committee, chaired by Senior Public Health Educator for the Oswego County Health Department, Diane Oldenburg, is collaborating to improve access to health care and preventative services; to improve healthy behaviors by addressing chronic disease, tobacco use, physical activity and nutrition; and to decrease the impact that co-morbid conditions have on the physical health of our residents in Oswego County. 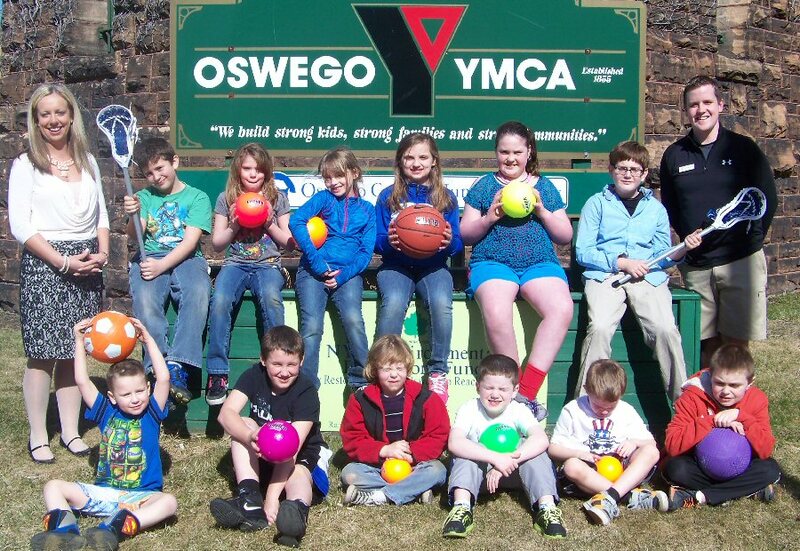 As part of its physical activity objective the committee surveyed every municipal and YMCA recreation program in Oswego County that serves low-income youth. The goal of the survey was to discover; how many youth were being served, what activities are currently offered, how to increase physical activity for the youth; and what these programs would need to do so. Wert added that in addition to the benefits of increased physical activity, participation in these programs will also aid youth in their character development. “Many of the playground balls that we purchased have positive character messages such as ‘honesty’ and ‘courage.’ Activity coordinators will be able to incorporate these character traits into the activities as a learning tool,” said Wert. For the Rural Health Network’s County Health Issues sub-committee this purchase of recreational equipment is just the beginning of their mission to encourage and enhance physical activity for youth. “We will continue to assist recreation programs throughout Oswego County and do what we can to help them meet the physical activity needs of our youth,” added Wert. Operating under the auspices of OCO Inc., the Rural Health Network is a consortium of health care providers and human service providers in Oswego County. Working together the members take a collaborative approach to addressing major health issues that exist in Oswego County.